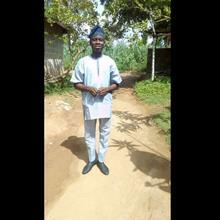 Am Fajingbesi Roid Olaowuye, an undergraduate in federal university otuoke,in bayelsa state Nigeria. before ganning admission into the university, I have tutor Yoruba language for a year,.apart from Yoruba is my mother tongue.Am a citizen of Nigeria. Teaching people is my hubby, because if we don't teach what we learn or know we will probably die with it someday. I can teach Yoruba perfectly.i think i can handle your request.